The Oscar DA-1200: A new single-auger juicer available now in our e-shop! Now available in our e-shop is the all-new Oscar DA-1200. This replaces the very popular model DA-1000. With a few new features and improvements, it is a worthy successor. The single-auger Oscar DA-1200 is a versatile machine that can handle eveything from apples and citrus fruits to root vegetables and even leaf vegetables. Its overall quality, ease of use, and high yield earned it a place in our shop. At first glance, you’ll notice that the DA-1200 is more sophisiticated than the older mdoel. It has a more compact and pleasing design. The most significant change is the larger feeding tube, which means less cutting of fruits and vegetables into smaller pieces. There are fewer parts, so dissassembling, assembling, and cleaning is easier. There are now only four attachments (instead of the previous six) for processing food, but this doesn’t limit what you can make. You can still easily prepare ice cream, baby food, peanut butter, and several types of pasta. The new Oscar DA-1200 is available in three colors: red, silver and white. A big benefit to owning a horizontal juicer is the versatility it offers. You can make more than just fresh juice. It can be a great time-saver for parents of babies and toddlers. Using the homogenizing function, you can make healthy baby food from fruits, cooked vegetables, or meats in just a matter of minutes. Or if you are a fan of fresh pasta, it’s super simple to make with a horizontal juicer. Just mix some dough, run it through the juicer with a pasta attachment, and put it into boiling water . Adjust the quantity of the ingredients depending on the age of your baby or toddler. 1. Boil all the ingredients until fully cooked. 2. Put in the Oscar homogenizing screen (instead of the juicing screen) and put the cooked ingredients into the feeding tube, alternating the ingredients so they will mix better. Because the materials are bisphenol-free, there’s so problem even with ingredients hotter than 60 ˚C. 3 Stir the mixed ingredients and it is ready to eat once it has cooled sufficiently. Tip: If you have a small baby and want to make a smoother baby food, just attach the ice cream or peanut butter adaptor. This will produce a smoother, creamier baby food. 1. Mix the ingredients together well, and roll out the dough. 2. Shape the dough into pieces that can fit into the feeding tube. 3. If the dough feels too stiff, add a little oil – this will help it go through the juicer more easily. 4. Attach the homogenizing screen (instead of the juicing screen) along with the round noodle attachment (the one with the larger holes). 5. Put the dough, piece by piece, into the feeding tube and gently feed it into the juicer with the pusher. 6. 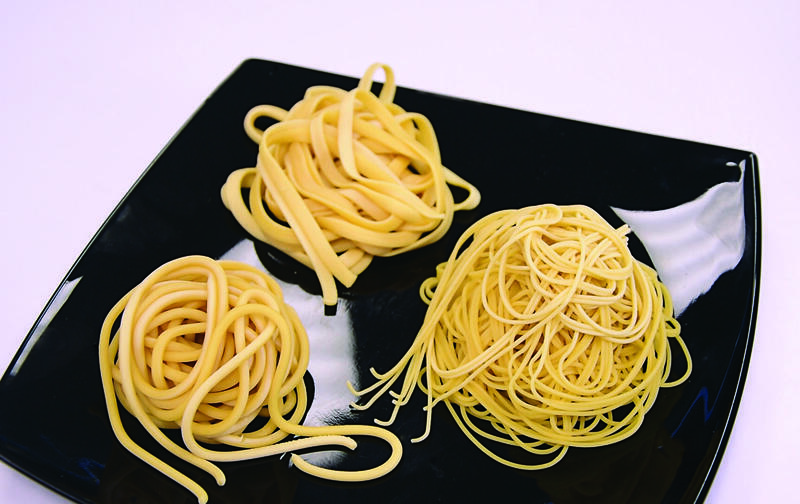 As the spaghetti comes out, you can cut it with scissors to the desired length, or don’t cut at all if you prefer extra-long spaghetti.